Cut the large marshmallows into thirds and set aside. Melt the white chocolate chips in the microwave by microwaving them in a large microwave safe bowl for 30 seconds. Stir. Microwave again for 15 seconds. Stir. Repeat in 15 second increments until the chocolate is melted. Once chocolate is melted, immediately stir in coconut oil. Stir oil in a tablespoon at a time. I used 2 tablespoons for this project but the amount needed will vary. Stir until the oil is totally melted. The chocolate should be shiny and slippery feeling. Dip the Oreos one at a time into the melted chocolate. Shake off excess and let them set on wax paper. When the Oreos are set, make bunny feet by dipping half of one side of the large marshmallow thirds into the remaining melted chocolate. Attach to the bottom of the Oreo by holding the marshmallow in place until the chocolate begins to set. This only takes a couple seconds. Repeat this process with the second bunny foot, placing it on the Oreo right next to the first marshmallow bunny foot. 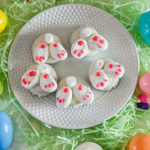 Then make the bunny tail by dipping one end of the mini marshmallow in white chocolate and pressing it gently above but centered in middle of the two feet marshmallows. Let set. Finish the bunny butts by drawing on feet details with decorator gel. Enjoy alone or use these to top cupcakes. *Add coconut oil in a tablespoon at a time. The amount needed will vary by the consistency of the chocolate, weather, etc. **These would make excellent Easter cupcake or cake decorations.